In a large mixing bowl, add flour, baking powder, pumpkin pie spice, and salt and whisk to combine. In a medium bowl, whisk together squash, almond milk, maple syrup, coconut oil, and egg yolks. Add the wet ingredients into the dry ingredients and stir until just combined. In small bowl, using a hand blender or whisk, beat the egg whites until stiff peaks form. Slowly fold the egg whites into the batter, stopping short of mixing them all the way through. 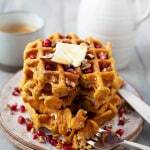 Pour waffle batter (about 1/2 cup) onto preheated waffle iron and cook according to manufacturer’s directions until golden brown. Optional: Serve with maple syrup, chopped pecans, whipped coconut cream, and/or pomegranate seeds. You can buy canned butternut squash puree or make your own puree by cutting a butternut squash in half lengthwise, removing seeds, brushing with olive oil, sprinkling with 1/4 teaspoon pumpkin pie spice, and roasting at 400 degrees F, cut side down, for 25-35 minutes, or until tender. Then scoop out the flesh of the squash and transfer to a blender or food processor to puree.